So - that Waheguru, that prabhu, that lord of the world jaa kai kal haath - in whose hands is all kal - all power. Maharaj Sahib jee is telling us that all power resides with Akaal Purakh. Sometimes the human being thinks oh I've this power, oh I can do this, I can do that, I have this much money or I am educated in such a way, oh my physical strength is more that other. But Maharaj sahibjee is saying that if you want to learn the path of bhagti then this shabad is teaching us the path of devotional worship. To be a bhagat, to be a devotee, Maharaj Sahib jee is telling us that we have to say bandhan kattai so prabhoo jaa kai kal haath - the truth is that all kal - all powers are in the hands of Waheguru. That is the realization that the devotee comes to. Bandhan kattai so prabhoo - Maharaj jee says if there is anyone who can cut through our bandhan - the cages which imprison us, those entanglements all around us. It is only prabhu - it is only Lord God Waheguru. In the same way Siri Guru Hargobind Sahibjee jee Maharaj liberated those 52 princes from the fortress of Gowalier by giving them the hem of their robe. In the same way the Guru attaching us to the hem of his robe can save us from this world and can save us from the entanglements of this world. Bandhan kaattai so prabhoo - that Waheguru is the one who can cut through all bandhans - all of the entanglements. Jaa kai kal haath - all powers are within Waheguru jee's hands. O maadhavae - O Lord of all of this illusion, made up of two halves: maa - meaning maya, this illusion and dhavae meaning the Lord of. O Lord of this illusion, O Creator of all this expanse tho saranaagath - I've aagath - I've come into Your saran. Aagath means to come into and saran means protection. I've come into Your protection pooran dhaeiaal because I've realized that You are pooran - You are the perfect dhaeiaal - the most perfect kindness abides in God. In human beings we see that kindness remains for one day, may be two days. People feel kind and they give presents and at some point, maybe once in a year, twice in a year, but that Guru, that Waheguru, that Light which is in all of us dokhan daekhat hai - sees our bad sins. We only give presents to those who we love, those who are close to us, our near and dear ones. But Wahegurujee, even the people who don't believe in Him, even those who speak ill of Waheguru jee, Waheguru dokhan daekhat hai - sees their ill, sees their vices par daet n haarai - but still gives them daily. In the same way He is pooran dhaeiaal. Guru Amardaasjee Maharaj is sitting upon the gurgaddi - the Guru's throne and the son of Guru Angad Dev jee Maharaj Baba Datu jee comes and kicks Siri Guru Amardaas jee Maharaj but in Siri Guru Amardaas jee Maharaj we see the qualities of this pooran dhaeiaal. Even though Maharaj Sahib jee was kicked by Baba Datu jee, Maharaj Sahib jee grabs hold of Baba Datu jee's foot and starts massaging it and saying, O my bones are old and brittle they may have hurt you when you kicked with them. That is pooran dhaeiaal - that complete sense of compassion. Those who have been rakhai - who have been protected by gopaal - paal the nourisher and go of this universe - who is that? - Waheguru. Those who have been protected by Lord God Waheguru shoot jaae sansaar thae - they've been liberated, they are released sansaar thae - from this world. What does that mean to be released from this world? That means that each of us is living in a cage. What is this cage built up of? The best way of explaining this in English, at least one of the ways which I came across was in the poetry of William Blake. Now you may be thinking how this relates to gurmath? Well William Blake tells us that we are all wearing mind forged manacles; meaning handcuffs forged by the mind. What is the Guru telling us? Let us take the virtue from what Blake has said and leave anything else. Lets just focus on this idea of mind forged manacles. Where do all of our desires, where do all of our hatred, where do all of these things (our ego) come from? All of these things are in our mind, are arising in our mind. It's these waves of the mind which become the manacles which we wear. A wave arises in the mind of desire and our eyes wander. A wave arises of hatred and our tongue speaks of bitter words. Those actions which are committed by these thoughts, those thoughts trigger actions and those actions become the manacles, become the handcuffs, become the prison, the cage in which we sit. We are all entrapped in these cages and there is no one else to blame because these manacles, these cages around us are mind forged - they are made by our own minds, they are made by the desires which dwell therein. Siri Guru Arjan Dev jee Maharaj is saying that if you want to be saved from these mind forged manacles, if you want to be saved from these mind's desires, this prison that you live in then who can save you? Raakhe gopaal - Waheguru jee can break open these entanglements. These entanglements are attachment, ego, hatred, slander, duality, doubts. Don't get it wrong, Guru Sahib jee is not saying shoot jaae sansaar thae - leave the world - No! Guru Sahib jee is saying that leave the entanglements of the world. Then like that bird, the bird is still within the cage - cannot open its wings but when the cage is destroyed the bird can fly through the skies and truly feel what it is to be alive. In the same way when these entanglements, when all of this cage is removed our souls can soar in Heavenly Bliss. Rehaao - Gurujee says pause and think about this. If we ask Maharaj what is this cage made of? Look, Maharaj Sahib jee answers us aasaa - our long held desires, that we've kept in our heart for a long time, bharam - the doubts. Bharam - what does it mean? To believe something which it's not. In the darkness of the night to see a rope and think it's a snake - that is bharam. That is believing that which it's not, bikaar - all the vices which we gather together through our desires and moh - attachment. Where do these all arise from? - Within, within our mind. You see how these are all mind forged manacles: aasaa, bharam, bikaar, moh - these all start from within and Maharaj Sahib jee says, ein mehi lobhaanaa - you have been lobhaanaa - entangled within these, mehi - means within, imprisoned in this cage. Waheguru jee is param - is the highest, the everlasting jot, the everlasting Light. The sun will fade one day, the starts in the sky will all fade but that Light of Waheguru will never fade because Waheguru is namo sooraj soorjay - the sun of all suns, Guru Gobind Singhjee tells us in Jaap Sahib - that Waheguru jee's Light is the greatest Pooran purakh - purakh means being, Waheguru jee is pooran - perfect in every way. Sabh jeea thumaarae - O Waheguru jee all of these jeea - all of these creatures, all of these beings, all of these souls are thumaarae - all belong to You, they are all Yours. O prabh - O my lord Waheguru, O my agam - meaning the One who is beyond the minds' desires, the minds' thoughts, apaarae - the One who is Limitless. 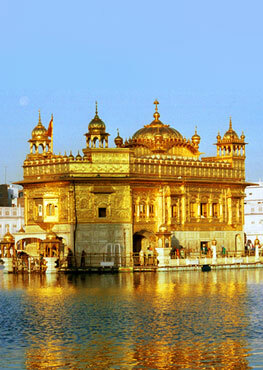 O Waheguru, O Limitless Lord jio thoo raakhehi thio rehaa - may I be content in Your Will. Thera keea meetha lagai - Guru Arjan Dev jee Maharaj tells us thera keea meetha lagai - before Guru Sahib jee talks about har naam padharath in that shabad, Maharaj Sahib jee says thera keea meetha lagai - may Your action seem sweet to me. Hey Waheguru jio thoo raakhehi - as You keep me thio rehaa - may I be happy in that. Whatever you give me may I accept that as your Beloved Will. The karan - the action and the reason for the action - You are all of these things. Samarath - all knowing prabh - O my Lord dheaehi apanaa naao - please bless me with Your naao - with the Name of the Lord, O Waheguru please bless me with Your Name. Guru Arjan Dev jee Maharaj says, if you want to be thareeai - if you want to be liberated go into the saadhsang - go into the company of the holy, into the Guru's congregation. What are we to do in the Guru's congregation? Har har gun gaao - the gun - the praises of har - that Waheguru Who is the nourisher of all, Who is Hari - Who destroys the sins of all, Who destroys the pains of all gaao - sing the praises of that Waheguru. Make your body into a gaao - gaao also means a village - make this village, this body a village of praise of the Lord with your man - mind, bani - your words, and your sareer - with your body - serve the Guru at all times, sing the praises of the Guru. In this shabad Maharaj Sahib jee is talking to us and saying, O gurmukh piaareyo if you want to be liberated from these entanglements then grab hold of the feet of the Lord, grab hold of the Guru's shabad. Fall in front of the Guru and surrender all to Him and then all will be resolved.